My husband served in the United States Marine Corps prior to our meeting and marrying. In January of 2009 our son graduated at MCRD San Diego. When April rolled around he and his new bride moved from our home in Washington State to Camp Pendleton. With them both being only just 18 it was hard to say goodbye! In August of 2009 my husband’s stepfather began serving at Heaven’s Gates. We had one more Christmas with our son and his wife that year then it was 11 months before we were able to see them again. My heart ached for my son’s presence; my wonderful mother-in-love was dealing with the loss of her spouse. On day I gathered my pitiful little heart up and screwed up my backbone and said to myself “I am the wife and mother of Marines! I will improvise, I will adapt, I will overcome!” Later I spoke to my husband’s sweet mom and she was down in the dumps. Not the kind to be coddled or fussed over, I reminded her that she could do this. I decided to make a half-sheet moto placard for myself and make the other half for her. Since she lives several states away, I mailed hers. She called me right after she got it, sobbing. She said she’d had to pull over on the way home from the post office and have a good cry, but that this placard was THE best thing because she needed to hear it. That’s the kind of woman she is and during her grief she’d forgotten it. My copy is on the wall next to my computer where I spend a lot of time. 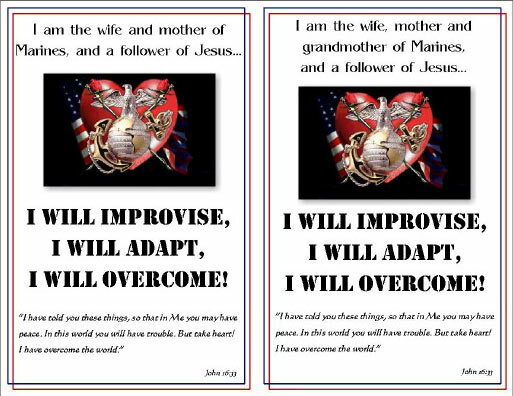 When I miss him and feel low I remember that I married a Marine and I raised one and that I have the ability, with God’s help, to improvise, to adapt and to overcome—it is my choice. Please find the placard attached, perhaps you can crop it appropriately and publish it—there may be another wife/mother/grandmother that might need to make herself one! Very Proud Wife and Mother of United States Marines!